Marston Baptist Church is entitled to $540,000 for the loss of its sanctuary and not the $172,000 to $221,000 offered by the N.C. Department of Transportation, the North Carolina Court of Appeals ruled Tuesday. He tried this and a recent similar case with Attorney Henry “Buck” Kitchin of Rockingham serving as co-counsel, along with Autry’s wife, Stephanie Hutchins Autry of Cranfill, Sumner and Hartzog. The Marston sanctuary had to be replaced after the North Carolina Department of Transportation obtained part of its property under eminent domain to widen U.S. 1. An action was filed to obtain a portion of the church’s land by the DOT in September of 2005. 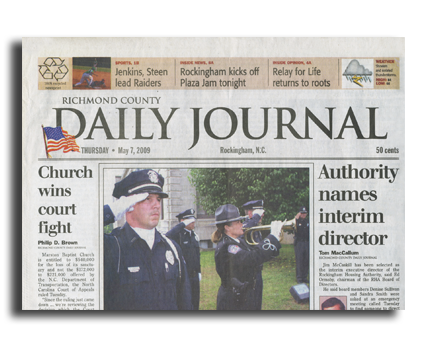 The church was originally awarded the money in a judgment entered by a Richmond County jury in Judge Michael E. Beale’s Superior Court on Feb. 6, 2008. It was heard by the state’s appellate on Feb. 23 of this year. The Department of Transportation was represented by North Carolina Assistant Attorney General Martin T. McCracken, who argued against the trial court’s decisions to allow testimony on the cost of a replacement church and against the nature of the jury’s instructions. The church began building a new sanctuary on the same parcel of land, and the jury of the first trial found the state D.O.T. argued it was being forced to pay the cost of a more expensive replacement. The defendant’s counsel successfully argued the property had not depreciated as much as the state’s estimators said. I’he cost of replacing the 4,500 square-foot structure was estimated by one witness to be between $486,000 and $583,000, allowing for construction contingencies. An expert witness for the church testified it would cost approximately $542,212. The state then argued the jury’s instructions didn’t match up with state statute for calculating damages. It is their claim the statements the jury heard were misleading, using it to rely on factors other·than the fair market value of the property before and after it was obtained by the state. The Appeals Court found no validity in either argument by state. A separate case was filed in Richmond County Superior Court on March 16 in the matter of DOT vs. Harvey and Rita Melton. The case was argued by the McCracken and Autry as well, and a Richmond County jury awarded Melton with a judgment of $871,000. When the action was filed in April 2007, the state deemed the property’s value to be $195,450. After interest, which the court decided to be 8 percent a year, total amount awarded in that case was $973,298.